Clarke's Court Old Grog is an aged spirit that is copper-gold in colour, medium bodied, with a tropical fruit and spice flavour, and oak elements that linger on smoothly. The distillery at Clarke's Court has been producing fine rums for many years, and is the largest distiller on the island of Grenada. Old Grog dates back to the earliest early days of rum, when the finest of Grenada's rum was shipped to His Majesty George III of England. In order to identify the King's rum, the casks were marked G.R.O.G., which is the abbreviation for Georgius Rex Old Grenada. 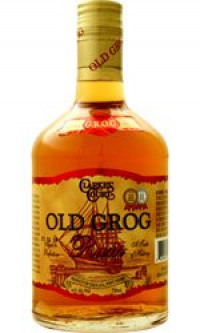 Old Grog rum maintains Grenada's tradition of producing the finest blend rums.